We’ve all seen it. 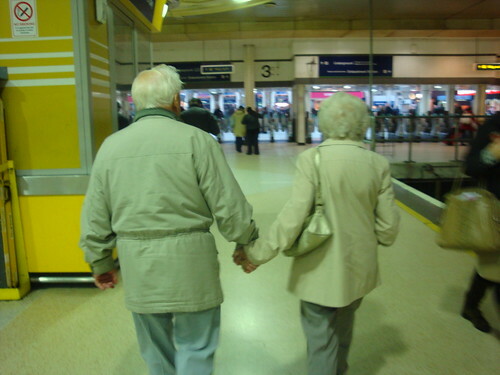 That cute older couple holding hands in the airport. It symbolizes a life-long match. Something many dream about and strive for. Together through thick & thin. You know the commitment each person has is absolutely amazing. Why can’t we do the same philanthropically? We can. Here’s how. Ahh, match-making. Parents do it for their high school kids, friends are experts at it for each other, and today, online dating is a $1 billion business with over 40 million users in the U.S. Arguably, philanthropic matchmaking is even more difficult, but the rewards for the donor and the organization are absolutely worth the pursuit. In some instances, match-making may happen during the initial meeting. If not, it’s ok. It’s best discussed in a serious, sit-down conversation. It’s crucial, and if done right, can lead to some serious connections. ‘The match’ in philanthropy happens when an individual finds exactly what they’re looking for in a relationship with an organization or cause and vice-versa. The hard part is navigating all the criteria in a giving relationship. Type of gift – cash, stock, volunteer time, property, knowledge, deferred/estate gift, etc. Timing of gift – monthly, annually, morning, around the holiday, tax season, etc. Medium of giving – online, via mail, in person, anonymously, etc. It is important to know what you can (and want to) offer. Go through each of the above and write down your preference. Look at your budget. Look at your calendar. Take an inventory of the skills and expertise you might have to offer. Look at your heart – what causes are most important to you? Most importantly – SHARE this with the organization. Don’t make them guess. Like loving couples – neither side is a mind-reader. Communicate your preferences and intentions. (Maybe even write them a letter.) Are you a serial monogamist? Looking to simply ‘try out’ the organization? Similar to society, lasting relationships are preferred and more appreciated :). Know what you’re looking for and be ready to share the appropriate giving ‘persona’ with the appropriate people. Make sure you’re set up with the right outlets for any combination of interests, levels and types. Ask the question of your presumed partner, “what are you looking for in an organization?”. Many donors won’t know or will not have thought about it. Work with them to find the answer that feels best for them. Reaffirm their choice and commit to walking this journey with them. The average donor life cycle is 5-7 years. Like in any relationship, honesty is key and it’s important to manage each others expectations. Be upfront with each other. Share your preferences, likes and dislikes. Understand that the other should do their best to fill the needed role, but compromise is key! Be clear with your intentions and respect the others’ interests. With the right communication, you’ll find a comfortable fit for you both! Have you found a perfect match? How’d you do it? Where do you struggle?